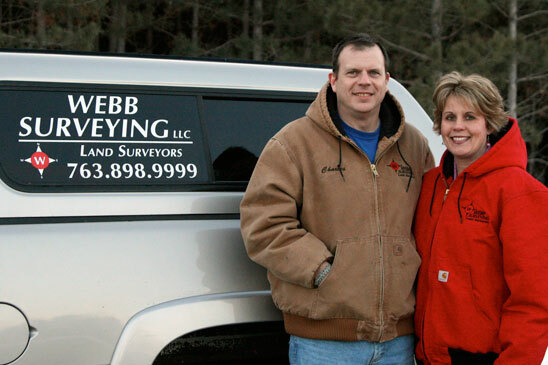 Webb Surveying is a professional, family-owned, land surveying company based out of Wright County, Minnesota. Offering a full range of land surveying services for residential, commercial, and agricultural properties, we continue to serve communities throughout the State of Minnesota. Staffed with dedicated personnel with over 30 years experience, licensed in both Minnesota and Colorado, we are capable of assisting you in any land surveying needs you may have. Our experience includes working with real estate agents, attorneys, title companies and governmental planning departments to ensure a complete and thorough survey of the desired land. Charles and Denise are active members of the Maple Lake Chamber of Commerce and their local church. Charles is also a member of the Minnesota Society of Professional Surveyors.